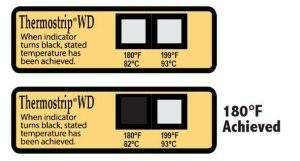 Thermostrip™ WD is a self-adhering, waterproof, colour-changing label that measures the surface temperature of medical instruments in washer disinfectors, bedpan washers and any thermal disinfector. Using Thermostrip™ WD on an instrument surface with each wash cycle will indicate that the minimum surface disinfection temperature has been reached. Label is adhesive backed, easily removed with no residue and retained, permanent and accurate. LCR Launches Thermocapture™ With Smartphone App Liquid Crystal Helps With Impressive Feat…….